Online retailers are slowly but surely stepping into the real world. After Flipkart opened stores where customers could pick up their supplies, Amazon is moving to the streets and towns of India to convince businessmen to sell through its platform. And the Seattle-based company’s latest acquisition push for sellers has a distinctly Indian whiff to it – it’s trying to woo people with hot cups of chai. Piloting in Bangalore, Amazon’s Chai Cart programme is used to spread awareness about the company among local small entrepreneurs and sellers in small cities and towns. These tea stalls will offer free cups of tea and coversations around getting businesses online. The programme will run for the next three days in retail hotspots like Commercial Street and Chickpet. 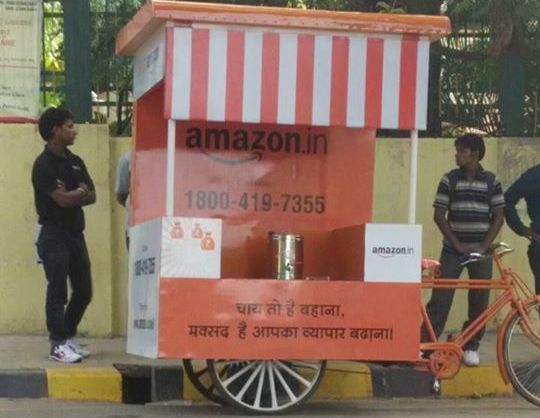 Amazon has deployed four ‘Amazon Chai Carts’ in these areas. “We realised that (the Indian seller base) is not as evolved or as sophisticated like other markets, therefore a lot of focus and investment from our side is going into these initiatives,” said Rohit Kulkarni, senior manager, new initiatives, Amazon India. Earlier, Flipkart had launched ‘FlipkartOne Stop’, a support facility that would equip sellers with necessary information and procedures to kick start and grow their business online. The company is offering services ranging across registration to training, cataloguing, packaging and financial assistance.